We’re off to a great start to the season here in Camden, Maine! May offered up some very warm and sunny days, perfect for sailing! Although June is a little shy in getting warmer, this coming weekend looks to be beautiful. Sunny and in the 70’s! We hope you’ll consider joining us for a great sail and if you want something “extra special”, why not come sailing on Father’s Day or for our Summer Solstice? The Father’s Day sail, on June 17th , will feature Dad. Dad gets to sail for half off if accompanied by a family member and our sailing times that day are 10-12a.m., 12:30-2:30p.m., 3-5p.m., 5:15-7:15p.m., or sunset sail from 7:15-9:15p.m. Come on and treat Dad right! Our Summer Solstice sail is on the longest day of the year, June 21st from 4:15-6:15a.m. That’s right, it’s early so you can be the first to witness the sunrise from the comfort of the Olad while enjoying warm coffee or tea and fresh baked goods. The colors of the sunrise will amaze you and if it’s anything like last year, it will be truly spectacular, including porpoises dancing around the boat and seals busying themselves with fishing for their first meal of the day. Cadillac Mtn. is also a special place to see the sunrise, but why be surrounded by a large crowd when you can be on the Bay with only a few individuals sailing peacefully on the Olad. The word must have gotten out that last year’s trip was unique because we are already half booked, so don’t wait! As usual, the Olad team looks forward to greeting you on the dock or in the store and we look forward to a fabulous summer in Camden. See you soon! For a Mainer it feels like we are on the cover of Rolling Stone. See for your self. Well, we are ready. We have been for two weeks. The Crew needs something to do so I said, "Why not run a weekend early." And so we begin the year with a soft start. 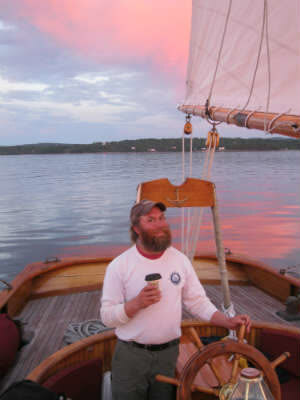 The schooner will make its first sail with passengers on Friday May 11, 2012 at 12:30 pm. The schedule will be as follows. We will run a 12:30pm trip and a 3:00pm trip on Friday, Saturday, and Sunday. We will be closed Monday thru Wednesday.. Then, we will have our official Start on Thursday May 17, 2012, and run the full schedule starting this day. (10:00am, 12:30pm, 3:00pm, 5:15pm) I am so excited. Here we are again, just days from the start of the 2012 maintenance program. It was an amazing 74 degrees in Camden, Maine yesterday, a record I believe for March. So, I feel like we might as well start fitting out early so we can go sailing sooner. I’d start May 1 if I could… I am just itching to be out on the water. This will be my 13th year sailing the Schooner Olad and I am still excited, and I feel that speaks of how wonderful the Olad is to sail, how great my crew is, and how amazing my guests are. If you have been sailing with me over last five years the faces are going to seem familiar. Matthew just got back from his winter adventure. He sailed from Spain to the Canary Islands then across the Atlantic to the Virgin Islands then to Jacksonville, Florida on a friend’s boat. Molly just finished the last day of the Camden Snow Bowl yesterday. She runs the ski school there where she taught hundreds of kids to ski and snowboard. Molly lives on Ragged Mountain and is often the first person on the hill. She snowshoes from home to the edge of the ski trails the snowboards the rest of the way, to the lodge, as part of her daily commute. I am sure they will have plenty of new stories to tell. What about the captain? Well, I spent the winter working on the schooner to keep it looking Bristol. In my down time I keep busy reading. I love having new history and boating material for each year. On of my prides is that people come back year after year and are amazed I can teach them something new and different on each trip. As far as the Olad, she just had her 85th birthday this year, but you would never know it. She is in pristine shape, and looks like she was just launched the other day. She can’t wait to start sailing out of Camden, Maine either. It’s hard to believe it has all come to end. Our last day of sailing for the 2011 season is this Sunday, October 23rd. The last trip of the day will be 12:30 p.m.
We just wanted to thank you all for making this year so amazing! We have broken lots of records, and had lots of fun. Thank you for all of your support and friendships, new and old. We hope that you have a great winter and we are already looking forward to starting back up again in the spring. Enjoy your holiday season and we will see you in May! Make use of our 25th Anniversary Sale, and buy tickets online today! We are celebrating 25 years of sailing in Camden, Maine and we would love for you to join in the celebration. We are offering a discount of $2.50 per ticket, when ordered online now through the end of the season. The leaves are starting to turn their beautiful shades of red, orange, and yellow, which only makes the vista more irresistible as we sail through Penobscot Bay. Always beautiful, the sights are truly stunning during the fall foliage season. If you haven’t seen the changing leaves from the harbor before, you won’t want to miss out. We have one last Full Moon Sail for this season, on Wednesday, October 12 from 4:30 – 6:30 pm. This is one of our most popular special events, as the sunset meets the moonrise and we return to the harbor as twilight descends. Bring some hot toddies or hot cider to make the evening extra cozy! Come see the Fall Foliage and Celebrate our 25th Anniversary! The leaves are just starting to change, and the air is getting crisp and cool. This is my favorite time of year in general, and an especially great time to be sailing! We are still celebrating our 25th anniversary of sailing in Camden harbor, so if you book online you will receive $2.50 off per ticket. The crew and I were talking about it just the other day, even on our regular 2-hour trips, we’ve been making it a little further out than we normally get to: plain and simple, the fall sailing breezes are here! People always ask us why we do the all-day sail in September. Truthfully, the days are just as warm, but we get a much a bigger breeze. In the last five years, I’ve been all over the place with our all-day sails. That extra breeze really helps us see a huge chunk of Penobscot Bay. I’ve never repeated the same route twice on this sail. I wake up that morning and check what the wind is doing, and try to pick the most magical place out on the Bay that I haven’t seen in years—since the time I sailed boats as a hobby. These trips are such an incredible opportunity to get an up-close look at the island communities, with their busy, working harbors. We always see multiple lighthouses on this trip, which is pretty exciting. On the two-hour sails we don’t usually get to see more than one, so it is truly a treat. Once we get over two hours away, we start to see the remote locations that are featured on so many postcards, that you normally don’t get the chance to see because it’s so far out to sea. My wife is famous among all our acquaintances for her flair for great meals, and we are lucky enough that she will be preparing the food for this trip! She always puts together a delicious picnic lunch, with sandwiches on artisan breads and a wide array of cheeses, interesting for the palate, satisfying to the appetite! As we head out, we will enjoy a selection of baked goods from one of the local bakeries, and a selection of smoked seafood for the afternoon snack. If you crave a nice, full day of sailing, of great food and company, and to explore this incredible bay, this is the sail for you! There is no better vantage point to admire the gorgeous fall foliage than from the sea. The colors should start appearing soon, and will only get better and better right through the end of our sailing season. This is one of the many reasons that September is my favorite month to sail. Don’t forget, we are still celebrating the Olad’s 25th anniversary of sailing from Camden harbor! If you book tickets online between now and the end of the season, they are discounted by $2.50 per ticket. One of my favorite parts is the Sail-In. Friday, on our 12:00 and 2:30 trips, we see all the boats sailing into the harbor in Camden, Maine. Everybody can see them and get tours at the docks after they put their sails down, but we will actually be among them as they’re sailing. The bay will look like times of old, with more Schooners and Windjammers than any other type of craft. We also will be leading the Parade of Sail on Sunday through the middle of Camden Harbor, which is also totally spectacular. It’s not often that you can sail a 19-ton boat through the inner harbor of Camden during the summer, but we get special permission for just one day. Both of these special trips can be reserved online (www.maineschooners.com) or by calling us at (207) 236-2323.